Hey everyone! Thank you so much for stopping by my blog. 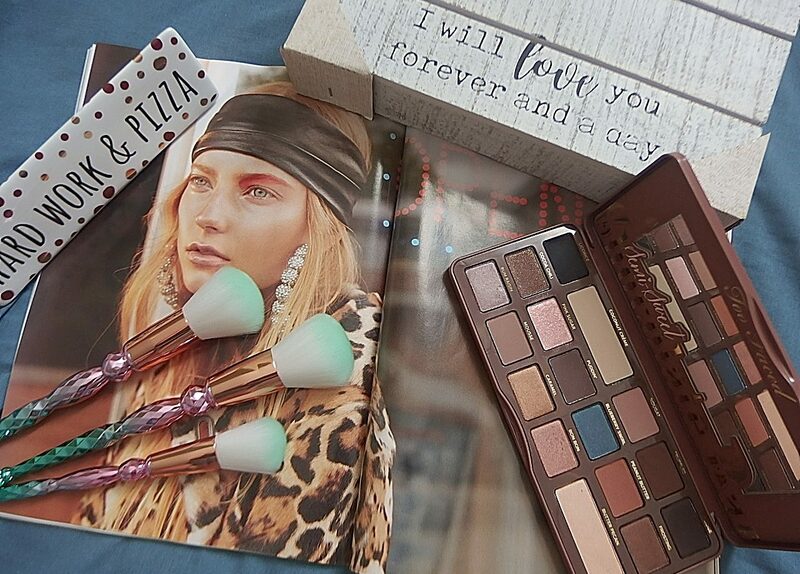 Today I’m going to share with you the latest eyeshadow palette which I ordered through Sephora website on Boxing Day. And it’s none than the Huda Beauty New Obsession Palette that I’m going to talk about in great length down below. Out of the four Huda Beauty new Obsessions Palettes line, the Warm Brown Obsession that I’m going to show you right now is the only palette that had one shimmer color and the rest were matte in case you’re wondering. The intense and incredibly pigmented shadows just blew me away. All the shades in this palette are my favorites. Love the color selections and the versatility. The packaging is super cute and made with a sturdy cardboard material. A compact size palette that’s travel friendly and it comes with a good size mirror which I really appreciate. This Warm Brown palette houses eight mattes and one shimmer shadows. These are some gorgeous, textured shadows with INSANE pigmentation. The color tones of browns, reds, oranges and that metallic bronze shadow in the middle is drop dead gorgeous. They’re suitable for any eye color or skin tone. I’m obsessed with this palette. They’re both full of the most gorgeous, build-able colors that take your look from day to night. This shade over here is like life. It’s so gorgeous and it just lifts your eyes in a good way. They will give your eyes this beautiful, 3D pop that I’m obsessed with! Texture wise, I’d say quite impressive. I’m pleasantly pleased with the formulation and the color payoff. A little goes a long way with these powder shadows. The three matte shades here are a total winner in my book. If I were to only pick one palette to wear in 2018, this is my go to palette right now. There’s no question about it! The first color from the left is Maroon Brown, then a Burnt Orange Light Brown followed by Orange Brown. Next row you get a Matte Medium Deep Neutral Brown, with a single Metallic Bronze and an Eggshell Cream color. So here are the nine eyeshadow shades from the Huda Beauty Warm Brown Obsession Palette look like on swatches. It’s interesting that you’ve that shimmery metallic shade and then it’s surrounded by all these matte shades. Quite an interesting concept don’t you think! The 3rd row is a Muted Matte Coral, next is the Soft Tan and lastly a Medium Warm Brown. I like all the mattes formulation simply because even though they’re pigmented, they blends incredibly well. They go on smoothly but not as creamy as I’d wish them to be but it doesn’t bother me at all. If you’re a color junkie, this palette has everything you need in a compact and affordable way. Well worth the investment! You can also check out their three other palettes in Electric Obsession, Mauve Obsession and Smokey Obsession at Sephora or Huda Beauty websites whichever you prefer. I hope you enjoy and find this post interesting. Again, thank you so much for all the love and support! It means the world to me! Don’t forget to stay tuned for more interesting and exciting stories coming up every Monday! Disclaimer: Post contains affiliate links for your convenient only. I don’t get any monetary compensation or perks from sharing these affiliate links. Product purchased with my own money & thoughts my own. I don’t wear make up often but when I do I want to make a statement and this definitely does that. I love the burnt orange and coral as well as the bronze. They say “look here I’m talking to you” to me. I love some of these shades. This is the second time I’ve heard about boxing day. I had to look it up to remind myself of what it was. This is such a wonderful palette. I love the way it looks!I would use all those colors. I keep seeing this brand everywhere. I think I need to check these out. This palette looks lovely. I love all the colors in the palette! They looks so rich and beautiful! They look pretty good!… I wish i could see what you mean about them lifting the eyes and giving them a beautiful 3D pop, though. Pretty colors! My daughter wears eye shadow and I’m tempted to get her this set. Although I do not use make up often, I like the eye shadow palette you featured here. I love that the colors are mostly earth tones which are my go to choice when using eye shadow! I’m obssessing over owning a palette of those soon. I have this palette and love it! It has been one of my favourites over the last few months. The colours are gorgeous and so pigmented. This palette is beyond gorgeous!